I have been pressing my hair and have noticed it is breaking and has started to feel thinner so I am thinking of having my hair relaxed instead. What do you think? When Black hair is pressed you are using a heated thermal tool to accomplish what a relaxer does through chemical action, to release curl and therefore straighten the hair. The heat is acting as the "relaxer", you need higher heat and expose your hair to longer sessions of it when pressing your hair. 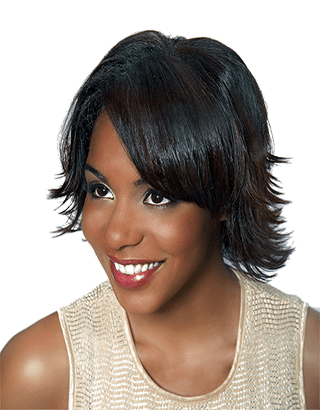 We do very little pressing in our salon as I believe if you want to straighten hair on a regular basis a relaxer is a superior way to accomplish this and less heat is required on relaxed hair to accomplish a finished hair style, plus you have the option of wet setting the hair which you don't have when you press. To use heat on Black hair as safely as possible, it's all about temperature. The best example I can give is this, if you have a silk blouse or a pair of wool pants, you may iron them for years with no damage, both silk and wool are made from protein matter as is our hair. However, if just one time through inattention to the heat setting or distraction you scorch or burn the item you are ironing, it is ruined. The same thing can happen to your hair. Your hair may not be ruined at casual glance but depending on how burnt and scorched the hair is you will have breakage in that area, which no treatment can repair, ofcourse the temaperature is lower for silk (also finer hair) than cotton (thicker strands). Moreover, the process of this type of breakage is not a even one, just as when you burn a blouse there are some areas more badly burnt and scorched than others, the same goes for your hair. 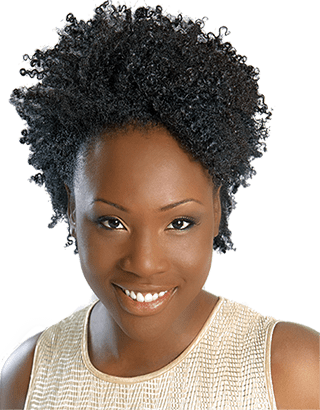 In your hair the areas that are burnt the worse will start to break first and then this breakage will progress to the next less damaged areas and so forth; this may last many weeks or even months. You can end up in a cycle of breakage that seems unending because of the way hair breaks off when thermal burning takes place. If you burn your hair again a few weeks/months later the cycle is perpetuated so it seems like your hair is always breaking and it will feel thinner. Most people use an oil or cream which generally are petroleum based and we do not believe in putting these kinds of oils on hair, and these creams have been know when heated with a hot comb or iron to run down onto the scalp causing burning, scaring and permanently damaging some people's hair and scalp. Finally, these pressing creams over time form a heavy coating on the hair - have you ever looked at an old frying pan and seen the burned on coating that heated oils leave - this coating is hard to remove, it weights the hair down - reducing bounce and body - and interferes with the way chemical services such as colours and even treatments perform on the hair. I view thermal styling tools with a tremendous respect, as to how they can impact the hair and scalp, as I do all hair service chemicals as well. I believe the less often you have to straighten and then thermal style with heat the better, as you greatly reduce the potential for burnt hair. A correctly applied relaxer is a better alternative especially when worn Wash and Wear. Being aware of the fact that the duller the hair the less cuticle layers one has the lower the temperature is required to straighten the hair. Some of my friends told me to try a deep conditioner with mayonnaise in my hair. Does the mayonnaise really work? If so, what exactly does it do for the hair? These are good questions. Let's start with mayonnaise. It for the most part is made from vegetable oil, eggs, lemon and vinegar. On the surface these may seem like a good things to put on our hair. We have vegetable oil not mineral oil, we have eggs for cholesterol and protein, we have vinegar and lemon juice which will close the cuticle to seal and add shine. My problem with using this product as a conditioner is that mayonnaise was really meant to go in us and not on us. When conditioners or treatments are designed for the hair the cosmetic chemist has a goal in mind, it could be to strengthen, add moisture, detangle, eliminate static charge, add body, add shine or it could be combination all of these with a special emphasis on one. The mayonnaise will do almost none of these things that are essential to be a good hair conditioner as well as a conditioner designed for hair will. Moreover, the three most important properties a treatment should have are absent in the mayonnaise; they are detangling ability, ability to re-moisturize and ability to repair. 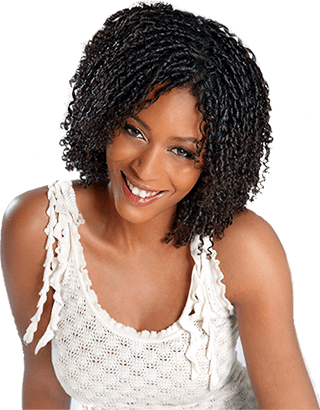 In selecting a protein to strengthen or repair hair, the formulator will have dozens of proteins to choose from, many are different in their effect on the hair, as well as from the source they are derived from. Most importantly, the protein he selects will be hydrolyzed and quaternized. Proteins found in such things as egg whites or dried milk have very large molecules, that while good to eat are much too large to be effective at adding strength, repair or changing the condition of your hair. When used because of their large size they will just sit on the outside surface of the hair and wash away when rinsed with water. When a protein is hydrolyzed it is chemically broken down into smaller sized molecules, so these molecules can now easily penetrate into the hair to offer maximum reconstruction of damaged hair. Just as important is the quaternization process. Protein matter has a natural negative charge, and this includes our hair, so when you put an unprocessed protein, such as egg whites, on to your hair you are putting a negative to a negative, there is no natural attraction. When a protein is quaternized by the manufacturer, it is changed from a negative charge to a positive charge, now when placed onto the hair the altered protein is attracted to the hair, it wants to lock in and on to the hair to repair and strengthen and it won't be easily rinsed off and go down the drain. Jasmine, I hope you can see how critical these processes are for a protein to be effective on the hair. The vegetable oil will add some lubrication but will mask dryness, and tend to add too much weight to your finished style reducing bounce and body and the vinegar and lemon will close down the cuticle but this is not effective conditioning. It is extremely important the product you treat or condition your hair with have good detangling properties, especially on relaxed hair, as relaxed hair is at its weakest and most fragile state when wet, so we don't want to rip and tear the hair trying to detangle it. There is nothing in the mayonnaise to detangle your hair. Also, there are a whole list of ingredients available to help to re-moisturize the hair that will not be present in the mayonnaise, and this is critical if your hair is dry and brittle; do you see where I'm going with this? There are many ingredients in any hair treatment a stylist may recommend to treat and help correct specific problems you may be having with your hair, none of which are present or correct in the mayonnaise. You feel will be much better off conditioning your hair with a properly formulated treatment than using mayonnaise on your hair in my opinion. I have a real problem with dandruff and my scalp is itchy all the time. What causes dandruff and what can I do to get rid or it? Dandruff is a subject with no easy answer because there is still a lack of total agreement by experts on what may actually cause the condition. There is currently still no known real cure for it and at sometime in our lives over 90% of us will suffer from it, and it can happen at any age from puberty on. Lets talk about just what dandruff is. As part of its normal cell reproduction cycle, your scalp continuously sheds dead skin cells. However, dandruff is when your scalp cell production and turnover is abnormally rapid, it’s like if your scalp had a thermostat, this thermostat has been set to high for unknown reasons. Now these cells collect on the scalp and they clump together to form flakes. When these flakes break free from the scalp they are easily seen in your hair as well as on your clothing. One of the most common conditions associated with dandruff is scalp itch. This itching can be very frustrating not only for social reasons but when scratched, your scalp can become irritated and even inflamed. An inflamed, irritated scalp is extremely sensitive when it comes time to do any chemical services on your hair. There are other causes of scalp flaking and itching such as seborrheic dermatitis. Seborrheic dermatitis usually appears as lesions or rashes covered by sometimes oily, yellowish or whitish scale. And is treated by some of the same products as used to treat dandruff. I just want to touch on the fact that although skin specialists can’t totally agree on a cause for dandruff, many do feel that dandruff is associated with a fungus called Pityrosporum ovale. This microscopic fungus lives on our bodies as well as our scalp, usually without causing a problem. However, for some people this fungus can increase in numbers. It is this increase in numbers that leads to dandruff in the opinion of some experts. Now what shampoos to use. We want to either use a shampoo that has a cytostatic agent; a cytostatic agent is able to slow down the rapid cell division we talked about earlier or "turn down the thermostat", zinc pyrithione is the one I prefer in a regular dandruff shampoo. I will not name a brand, just look on the back at the ingredients list and see if the dandruff shampoo you are considering has this as its active ingredient. The other one I sometime recommend an anti-fungal; Nizoral® shampoo. It is by far the one most often prescribed by doctors and pharmacists for treating dandruff and is effective if you may have seborrheic dermatitis. This shampoo will act to inhibit the growth of any fungus on your scalp. My preference would be to see you try the Nizoral® first and see if it works and is effective for you. The most effective way I find to use any shampoo that you are using to treat a scalp condition is this. Start by dampening your hair, just your hair and not your scalp, be sure not to have your hair dripping wet. Now using your fingers to part your hair slow apply the shampoo to your scalp, try to get none on your hair, do this all over. After applying, gently work it into the scalp. Leave it there for 10 minutes. Now apply more water to your entire hair and rinse it out well. If you have natural Afro textured hair you may work it into a lather if you wish. If you have any type of chemically treated hair I prefer that you don’t cause it to lather, just rinse it out well. Now follow this with a conditioning shampoo (see my thoughts on conditioning shampoos in the next letter) work this into a good lather, very gently but thoroughly scrubbing the scalp, you may do this twice. Always finish by conditioning your hair and style as usual. If you feel your dandruff is still persisting as bad after about 6 weeks, you will need to see a dermatologist to have him have a look and for further help. My daughter is bi-racial (Black and White). Her hair is very curly, hard to manage and tends to be quite frizzy. She usually keeps it in a braided pony tail but wishes she could wear other styles. Do you have any tips for this type of hair? Our salon's clientele includes many clients with a mixed racial background. This for us typically tends to be Black mixed with many other races, but most often White. People of this multi-racial background mix have a natural hair texture that can run from lightly wavy to super curly Afro textured hair, but most often it is similar to your daughter’s, very curly but not Afro textured. Your daughter has naturally through genetics, what we accomplish with our Wash & Wear Relaxer™ technique to Afro textured hair. However, sometimes mixed race hair can have two or three different textures (curl pattern tightness) all on the same head and I find I have to occasionally apply a partial Wash & Wear Relaxer™ technique or even sometimes a full one to evenly match all the textures, or to sometimes just loosen up the wave pattern a little more for ease of style. I always encourage people with hair like this to embrace it, learn to work with it, and not try and relax it straight. Most people with hair like your daughter’s find that after they shampoo and condition their hair, when they let their hair just air dry naturally, there is a point between wet damp hair and dry hair, where their hair looks just perfect, how most people would desire it look all the time. It’s soft, with nice ringlets corkscrewing down, this only lasts for a short period of time and then the hair completely dries. At this point the corkscrews lose their definition and the hair becomes somewhat dry, puffy and frizzy. Your daughter's naturally curly hair needs specific products to enable it to remain all day in that desirable zone I described. These products will also maintain a constant level of moisture to ensure softness and to aid ease of style. 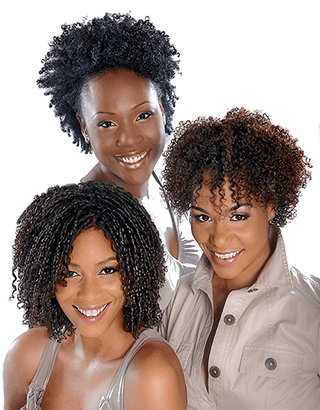 They are Kerasoft Interlink Leave-In Conditioner, Quench Moisturizing Spray, Revival Curl Revitalizer and Actisilk Curl Enhancer. These products are water based, non-greasy and without them naturally curly, bi-racial type hair does tend to want to sometimes be a ball of frizz. When your daughter blow-dries and irons to wear a straight style. The newest way to fight frizz is with a shining mist or glossing polish, such as our Kerasoft Glas Spray Shine Mist and Glosify Hair Polish. These new "wonder" products are made with the purest and finest conditioning silicones. Just a little of these concentrated styling tools will smooth the cuticle layer of the hair so it lies flat and seals out that dreaded moisture on humid or rainy days and they add a tremendous amount of shine to the hair. One other thing. She needs a good conditioning shampoo. Patricia, it’s not good enough for it to say conditioningshampoo on the bottle. Without getting too technical on you, if the shampoo starts with ingredients such as sodium lauryl sulfate, ammonium laurel sulfate, sodium myreth sulfate or any lauryl/laureth sulfate or similar sounding names. I recommend that you not purchase or use these shampoos for your daughter. They are not truly designed for naturally curly or Black hair and I find they tend to be much too drying and stripping, which is not good for hair with curl. As we all know, dry stripped hair equals frizzy, puffy hair. As a further note; people with curl in their hair do not want to use a shampoo that will make their hair "squeaky clean". As hair that squeaks after shampooing, denotes that the hair has been stripped to a state with no lubrication that it can squeak. While for people with straight hair this may be fine. However, for people with curl this is not what we want, some mothers, like yourself, that come to me don't realize that hair with curl in it needs much different shampoos and conditioners that straight hair does. A shampoo that is designed for hair with curl should be formulated in my opinion with amphoteric surfactants - surfactant means; surface active agent, a fancy technical way of saying cleanser. Amphoterics are mild cleansing agents that are neutral in nature and gently cleanse the hair without stripping it. Some product manufacturers do add strong conditioning agents to their shampoos that contain the laurel sulfates as their active ingredients to compensate for the stripping action of these cleansers. However, this is not sufficient or good enough in my opinion. Also, many do this to save money as there are higher costs involved in manufacturing with amphoterics. (* There is an exception to this guideline, this being sodium trideceth sulfate, it acts synergistically with amphoterics when added with them to a shampoo as a secondary cleansing ingredient). For example our Kerasoft Enrich Conditioning Shampoo costs our company probably 2 -3 times more to manufacture than a shampoo using lauryl sulfates would. We do use ingredients that are called amphoterics as our main active cleansing ingredients. They are non-stripping, gentle and yet thoroughly cleanse the hair, as I just mentioned. In the shampoos I recommend, the first item in the ingredient listing after water should be an ingredient such as lauroamphoglycinate, cocoamphocarboxyglycinate, cocoamphopropionate, there are quite a few variations on these names but they should be similar. If you noticed they all contain "ampho" in their name, this will help you in determining if they are an amphoteric based shampoo. I hope this not too technical, but you need to know how to purchase a superior shampoo for curly textured hair. As long as it’s not a lauryl sulfate based one you should be all right. And as always, she needs a good detangling moisturizing conditioner to finish with, such as our Kerasoft Reflex Moisturizing Treatment. These products I believe will give you the kind of results you desire for your daughter's hair. I hope this helps for now.